You have often heard people saying that the demise of RIM’s Blackberry is near, as the popularity of Android (previously known as iPhone) is gaining momentum steadily. But this is not the entire truth. Let us have a look on an interesting piece of information: Blackberry is growing as fast as Android, at least in global Web pages, says the data from Statcounter. The data says that the users of Blackberry have doubled their Web presence in the last 12 months. 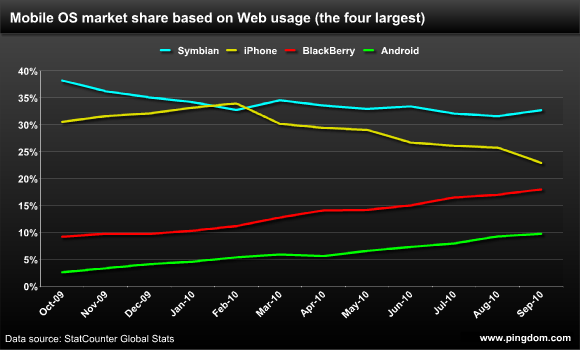 So, the reports about Blackberry that it is falling behind in the mobile race are probably not based on facts. There is no doubt that Android is gaining fame over Blackberry, at least in terms of Web usage, and has a larger portion of pie overall, but only in US market. But still it is not a wise thought to count RIM out on the basis of these reports. We have seen an improved browser (Webkit based, just like the one in Android and iPhone) in a newest blackberry OS (version 6) and with this we may even assume to see a considerable increase in Blackberry Web usage in coming months. Another important thing here to mention is that the usage of the Blackberry has been growing even before the appearance of new OS and browser. This might be due the rumors of Blackberry’s demise. In many of the European countries the Blackberry is more or less a no show. The people there may be only interested in gaining the knowledge about what is the reason behind increase in Web usage. This can be due to the changing behavior of Rim’s existing users, or may be this is normal increase but the reports are based on irrelevant facts.